AUCTION IS FOR 5 SEEDS FROM THE CROSS OF VAN HELSING X WOLFMAN. (2013 Polston) 26" 5.5" 4-5 Way Branching. 25 Buds. Dor, Tet. Professor Abraham Van Helsing is a fictional character from Bram Stoker's 1897 Gothic horror novel Dracula. 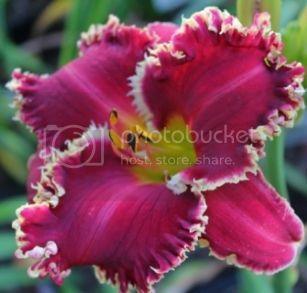 "Van Helsing" is another stand-out in a continuing series of toothy daylilies from Pleasant Valley Gardens.